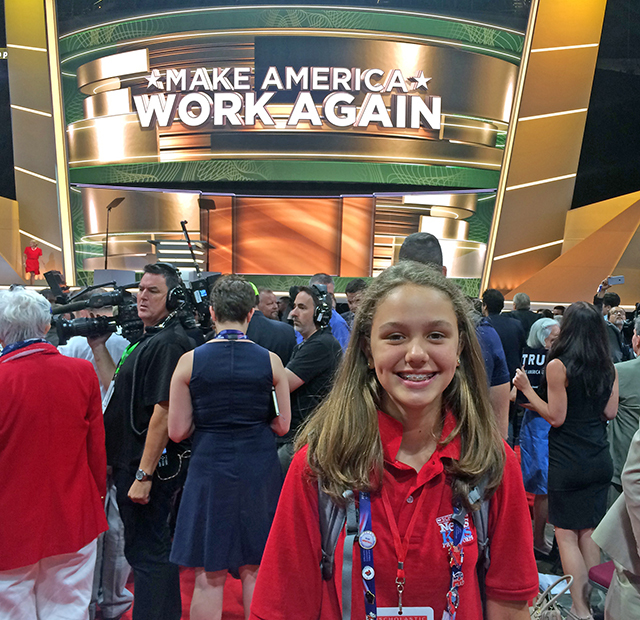 A Memorable Night in Cleveland | Kid Reporters' Notebook | Scholastic Inc.
After two days of voting state by state, it was official—Donald Trump will represent the Republican Party in the 2016 presidential election. The formal voting of the delegates (representatives from each state who generally have to vote the way their state did in the primaries) took place last week at the Republican National Convention (RNC). The results came as no surprise. Trump, a New York City real estate entrepreneur, was the frontrunner throughout the primary election season. He racked up more primary votes than any other Republican in history. Many people at the RNC welcomed Trump as their nominee. Others, such as delegates from Colorado and Virginia, who walked out of the convention in protest, are not yet ready to embrace him. Neither are several of Trump's former rivals for the Republican nomination, including Texas Senator Ted Cruz, former Florida Governor Jeb Bush, and former Ohio Governor John Kasich. In a speech at the convention, Cruz refused to endorse Trump, drawing boos from the audience. Like Cruz, many Republicans say that Trump does not share their conservative values. They also do not like the negative statements that he has made about Muslims, Mexicans, and people who are disabled, among others. This year, the RNC was held in Cleveland, Ohio. Cleveland was also home to the 1924 and 1936 Republican conventions. The best part of the night was when I got to go down on the floor of the Q, where the delegates and speakers sit. I had never seen so many people in one place. Delegates were walking around, chatting with one another, listening to speeches, and being interviewed. Wolf introduced me to Brad Schimel, the Attorney General of Wisconsin, and Brad Courtney, the Chairman of Wisconsin’s Republican Party. It was incredibly cool to be part of this history-making convention and to help show kids how and why politics matters to them. Lilian interviews Brad Courtney, the State Republican Party Chairman in Wisconsin, at the Q.